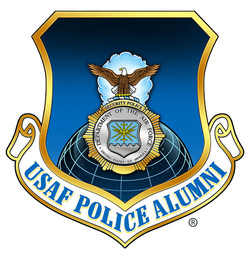 ﻿Welcome to the USAF Police Alumni Association official USAF Air Police, Security Police and Security Forces Memorial Page. 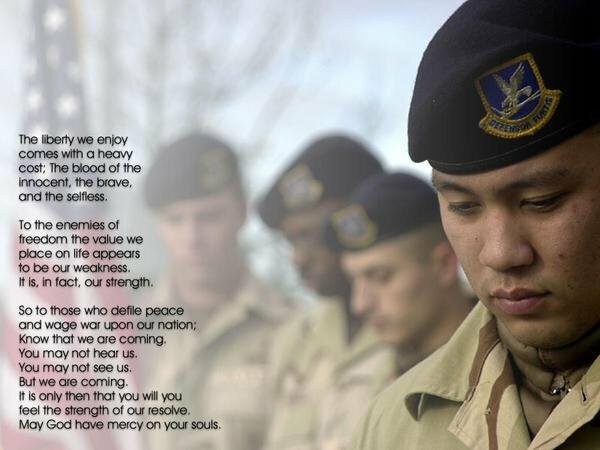 On this page we will honor the service and sacrifice of each USAF member that has served and given the ultimate sacrifice protecting this great country of ours. We will forever honor the men and women here on this Memorial Page. This is a place of honor and respect. Should you find information on this site that is inaccurate or missing, please contact the USAF Police Alumni Association at JShanks@usafpolice.org so that we can research and correct and/or add the information. 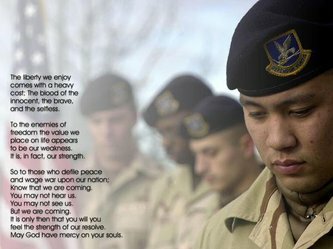 Our vision for the future will be to allow our brothers and sisters who have served with these fallen heroes and our fallen heroes family members to submit personal tributes and create a living Memorial that generation of survivors will visit and learn about the sacrifice of the blue beret. The Memorial has several sections, those airmen killed while in combat or conflict (Recent, Vietnam and past) and those killed performing law enforcement and security duties not combat related. The below image was presented to the USAF Police Alumni Association on November 13, 2104 by CMSGT Steven White, Security Forces Career Field Manager at the Pentagon. The picture depicts 10 USAF Security Forces Heroes that have died protecting and defending this great nation of ours since Sept 11, 2001. RIP Defenders! In an effort to continually honor the service and sacrifice of our United States Air Force, Security Forces, the USAF Police Alumni Association is honored to recognize all of those who have given the ultimate sacrifice in the line of duty, whether at home or abroad. In this section "Recently Fallen" we will honor those men and women who have most recently given the ultimate sacrifice in the line of duty. Attention to Orders: The USAF Police Alumni Association hereby recognizes the service and sacrifice of these defenders who so unselfishly paid the ultimate sacrifice in defense of this great nation. Rest in Peace Defenders. TSgt Joseph Lemm and SSgt Louis Bonacasa of the 105th Security Forces Squadron were part of an off-base movement when a Taliban suicide bomber on a motorcycle crashed into the movement and detonated his bomb. Security Forces members Lemm and Bonacasa along with four AFOSI special agents were all killed in the attack. TSgt Lemm is also a Detective with the NYPD. A1C Ruiz and 11 others were killed when a C-130 crashed while serving in Afghanistan. A1C Kcey E Ruiz and Sra Nathan C. Sartain; were both assigned to the 66th Security Forces Squadron at Hanscom Air Force Base, Massachusetts. They performed fly-away security team missions, guarding aircraft, cargo, crew and passengers. the accident occurred. Despite wearing his seat belt, Sergeant Watts received serious injuries when he was ejected from the military police vehicle. He died the following day. Description: Officer Frasier was killed in an automobile accident while patrolling Edwards Air Force Base in California. While attempting to negotiate a curve on a poorly lighted road, Officer Frasier lost control of her department vehicle and overturned. Officer Frasier was killed instantly. Master Sergeant Michael D. Harmon of the 178th Security Forces Squadron of the Ohio Air National Guard died in the line of duty on January 31, 2002, while serving on active duty in support of Operation Noble Eagle. MSgt Harmon suffered a fatal heart attack during physical training on base. In May 2015, MSgt Harmon will be recognized on the National Law Enforcement Officers Memorial in Washington, D.C. Description: Technical Sergeant Simons was killed after being struck by a vehicle while directing traffic at Nellis Air Force Base, Nevada. Sergeant Simons was struck by suspect's vehicle which was traveling approximately 45 mph. He was taken to a local hospital where he remained unconscious until his death two days later. Description: Officer Day was patrolling Tinker Air Force Base after the recent tornado. He was patrolling near a fence that had been knocked down by the tornado. As he tried to avoid the debris on the road, his patrol cruiser flipped over. He died of extreme chest injuries a few hours later. Security Policeman David R. Schroeder, Jr. Description: Airman 1st Class Schroeder and three other Air Force personnel were investigating a suspicious vehicle on the military side of the Kuwait City International Airport. AIC Schroeder was a passenger in the military van when it crashed due to speed and road conditions. The vehicle flipped over and rolled three times when it went from an unpaved road to a paved road. Security Policeman Charles V. Campbell, Jr. Description: Airman 1st Class Campbell and three other Air Force personnel were investigating a suspicious vehicle on the military side of the Kuwait City International Airport. AIC Campbell was a passenger in the military van when it crashed due to speed and road conditions. The vehicle flipped over and rolled three times when it went from an unpaved road to a paved road. Description: TSgt Butler was killed after he stopped a vehicle occupied by suspect who had just killed another serviceman. Suspect shot and killed TSgt Butler and later committed suicide. Incident took place at Edwards Air Force Base located in Bakersfield, California. Description: A1C Sharp was a passenger in a USAF Security Police vehicle that was involved in a vehicle crash while en-route to his post. During the crash it is reported that an ammo can in the vehicle struck A1C Sharp in the head causing a fatal head injury. A1C Sharp was assigned to the 448 Missile Security Squadron and his home town is Dayton, Ohio. A1C Matthew Sharp is not listed on the National Law Enforcement Officers Memorial or the Officer Down Memorial Page. We are submitting his name for inclusion on these memorials. Description: Sergeant Levay was killed while attempting to stop a robbery attempt at the Andersen Air Force Base commissary in Guam. Sergeant Levay was escorting a commissary clerk with $74,000 to the night depository on the air base when he was attacked by five men. Two suspects were convicted of murder and one suspect was convicted of robbery. The other two suspects were not captured. Description: Officer Riggs stopped to render assistance after an accident. The military vehicle he was in came in contact with a damaged power line. He was electrocuted when he touched the vehicle. He was stationed at Whiteman AFB in Missouri with the 351st Missile Squadron. Description: In August of 1991 while stationed at Anderson Air Base, Guam Airman Lucas was participating in training exercise Midnight Trail. While assigned to a M-60 machine gun position the aggressors in the exercise threw a stun grenade into Airman Lucas's position. When the grenade exploded it severely injured Airman Lucas. She died several days later at the base hospital with her parents by her side. Airman Lucas is the first USAF Security Police Woman to die in the line of duty. At this time Airman Lucas is not on the National Law Enforcement Officers Memorial or listed on the Officer Down Memorial Page. Description: Officer Elms was shot during live fire training exercise for security police officers. Description: On October 28th, 1987 A1C Steven M. Faust was on his way to work as a Security Policeman at Clark Air Base, Philippines when he was targeted and gunned down by Philippine Terrorists along with another Airman and two others. A1C Faust had been assigned to Clark Air Base since February 20th, 1986 and worked as a Law Enforcement Specialist and K-9 handler. A1C Faust is from Pasadena, Texas. On May 29th, 1986 a USAF UH-1 helicopter with six crew members crashed while providing security for a missile maintenance movement just outside Sturgis, S.D. The pilot Captain Brian G. Snider and Co-pilot 2nd Lt. David H. Gordon were killed in the crash. Three USAF Security Policemen were killed in the crash; Senior Airman Donald Heitkamp, Airman First Class Berry P. Holmes and Staff Sergeant Charles L. Huskey were killed in the crash. USAF Security Police Airman First Class Latania Huguley was the sole survivor of the crash. On May 29th SSgt Huskey was part of a four person fire team assigned to provide missile convoy security. During the convoy the UH-1 helicopter he was in crash just north of Sturgis, SD. On May 29th SrA Heitkamp was part of a four person fire team assigned to provide missile convoy security. During the convoy the UH-1 helicopter he was in crash just north of Sturgis, SD. On May 29th A1C Holmes was part of a four person fire team assigned to provide missile convoy security. During the convoy the UH-1 helicopter he was in crash just north of Sturgis, SD. Description: TSgt Chatman was the A-Flight Chief at Lackland AFB on April 23rd, 1984. The base was getting ready for an ATC inspection and the Security Police Squadron was conducting an anti-robbery exercise at the base exchange. TSgt Chatman was ordered to do in-person post checks around the perimeter of the cordon. Upon completion of the exercise TSgt Chatman returned to the SP Desk/Operations where his wife was awaiting on a phone line to speak with him. He had a brief conversation with his wife and then collapsed from a heart attack. TSgt Chatman was transported to Wilford Hall Medical Center and later died from cardiac failure. TSgt Chatman is a Vietnam War era USAF Security Policeman. Description: On March 8, 1983, one man of a two-man security team was accidentally shot and killed by his partner. The victim was identified as Airman Daniel J. Kopp, age 20. Amn Kopp's team member had unknowingly chambered a round into his M-16 forgetting to take out the magazine. When he "Dry Fired" the weapons it discharged striking Amn Kopp at close range. Airman Kopp died at the scene despite CPR and a helicopter rescue team. Airman Kopp was assigned to the 45th Missile Security Squadron, Ellsworth AFB, SD. On June 11, 1982, Whiteman AFB, lost six Airmen after their UH-1F Iroquois helicopter crashed in a rural area 30 miles south of Kansas City. The two pilots from Detachment 9 of the 37th Aerospace Rescue and Recovery squadron, and four security policemen, from the 352nd Missile Security Squadron were providing security for a routine Air Force convoy transporting weapons system from Whiteman to a launch silo near Passaic, Mo. At the time, the UH-1 helicopter was one of four assigned to a military unit responsible of monitoring 50 of the Whiteman area missile silos. Description: SSgt Bohling was the Charlie Fire Team Leader when he and his fire team were killed near Whiteman AFB, Missouri. Please visit our Charlie Fire Team page to learn more about the brave men who gave their lives protected our country. Description: SrA Pace was a member of Charlie Fire Team he and his fire team were killed near Whiteman AFB, Missouri. Please visit our Charlie Fire Team page to learn more about the brave men who gave their lives protected our country. Description: SrA Jones was a member of Charlie Fire Team he and his fire team were killed near Whiteman AFB, Missouri. Please visit our Charlie Fire Team page to learn more about the brave men who gave their lives protected our country. Description: Sgt Meredith was a member of Charlie Fire Team he and his fire team were killed near Whiteman AFB, Missouri. Please visit our Charlie Fire Team page to learn more about the brave men who gave their lives protected our country. Security Policeman William Herrington was killed by terrorist assassins while stationed in Incrlik, Turkey. Policeman Herrington was on his way to work in full uniform when four terrorists surrounded his vehicle while he was backing out of his driveway. Over 50 shots were fired at him, 17 of which struck him. He was transported to a local hospital where he succumbed to his injuries a short time later. Description: Officer Dover was killed when a motorist ran a car through a guard gate, hitting the guard post and killing the officer on duty. He was assigned to the Kelly Air Force Base in Texas at the time of his death. Description: Officer Campbell was dispatched to check the area for a suspicious individual. When he arrived, he encountered a 16 year old juvenile stealing a bicycle. As he was approached the boy shot the officer. He was with the 42D Security Police Squadron at Maxwell Air Force Base. Description: Officer Gray was stabbed in the chest as he attempted to apprehend trespassers at the Clark Air Force Base in the Philippines. Officer Gray had been assigned to the 3rd Security Police Squadron. Description: A1C Daniel P Schlim and other Security Police members were at the Main Gate at Davis-Monthan AFB, Arizona when another Airman pulled his service revolver and shot Schlim in the chest killing him. A1C Schlim is from West Covina, California and was 19 years old at the time of his death. The airman who fired the shot was Court Martial for Involuntary Manslaughter and Dereliction of Duty. Description: Sergeant Roberts and Sergeant Reynolds responded to a domestic disturbance on George Air Force Base, San Bernardino, California. The suspect (also military) opened fire on the Air Force Policeman, killing Sergeant Roberts and wounding Sergeant Reynolds. Description: Aircraft accident. Officer was working at the security gate when an airplane struck the gate, killing the officer. Officer Hursey was stationed at Eielson Air Force Base with the 5010 Air Base Group. Honoring those who fought and died in Operation Operation Iraqi Freedom and Enduring Freedom. Description: Amn Jacobson was killed on September 28, 2005 near Camp Bucca, Iraq when the vehicle she was riding in was struck by an Improvised Explosive Device (IED) . She was the first security forces member killed in the War on Terror and the first killed in action since the Vietnam War. Description: SSgt McElroy and Tech. Sgt. Jason Norton were killed on the same patrol 18 miles north of Baghdad when their vehicle struck by an improvised explosive device. Description: Tech. Sgt. Norton and SSgt Brian McElroy were killed on the same patrol 18 miles north of Baghdad when their vehicle was struck by an improvised explosive device. Description: Airmen Chavis was killed in Baghdad, Iraq by an enemy sniper while supporting an Iraqi police convoy. Description: While on his 79th combat patrol, Staff Sgt. Self was killed while assisting Iraqis in the streets of Baghdad when the vehicle he was riding in was struck by an Improvised explosive device. Description: Airman Nathan was killed, June 23, 2007 in Iraq when the vehicle he was riding in was struck by an improvised explosive device. Description: Staff Sgt. Griffin was killed during his fourth tour in Iraq while on patrol near Baghdad. The vehicle he was riding in was struck by an improvised explosive device. Description: Lt. Helton was killed while on a patrol near Baghdad, Iraq when his vehicle was struck by an improvised explosive device. A 2007 Air Force Academy graduate, he was the first security forces officer killed in action in the War on Terror. Staff Sergeant Lobraico was killed after his unit was ambushed and attacked by insurgents by small arms fire while on patrol outside Bagram Air Base, Afghanistan. SrA Sartain and 11 others were killed when a C-130 crashed while serving in Afghanistan. Senior Airman Nathan C. Sartain, 29; and Airman 1st Class Kcey E. Ruiz, 21; were both assigned to the 66th Security Forces Squadron at Hanscom Air Force Base, Massachusetts. They performed fly-away security team missions, guarding aircraft, cargo, crew and passengers. SSgt Louis Bonacasa and TSgt Joseph Lemm of the 105th Security Forces Squadron were part of an off-base movement when a Taliban suicide bomber on a motorcycle crashed into the movement and detonated his bomb. Security Forces members Bonacasa and Lemm along with four AFOSI special agents were all killed in the attack.